With a bit more digging, it looks like someone built their own web app for OmniFocus. It's in open beta, but looks to be a $3/month sub. I don't know I'm really in the market for a 3rd party tapping into the sync, but maybe nearly 3 years of discussion in their forums and this one-man-project will get OmniFocus to decide to make an official web app. I'm not holding my breath, though. Yep. I'm (infrequently) using this IFTTT recipe/applet and the first step is to tell Siri which list. May require some tuning of the list name so it's easily recognizable. I always thought Siri supported that natively. In the RTM scenario where it is the default list, telling Siri, "remind me to walk the dog" will instantly add it RTM. But you could also tell Siri, "add eggs to my shopping list" which would add it to a different list and therefore not add it to RTM. Here's what my list looks like. 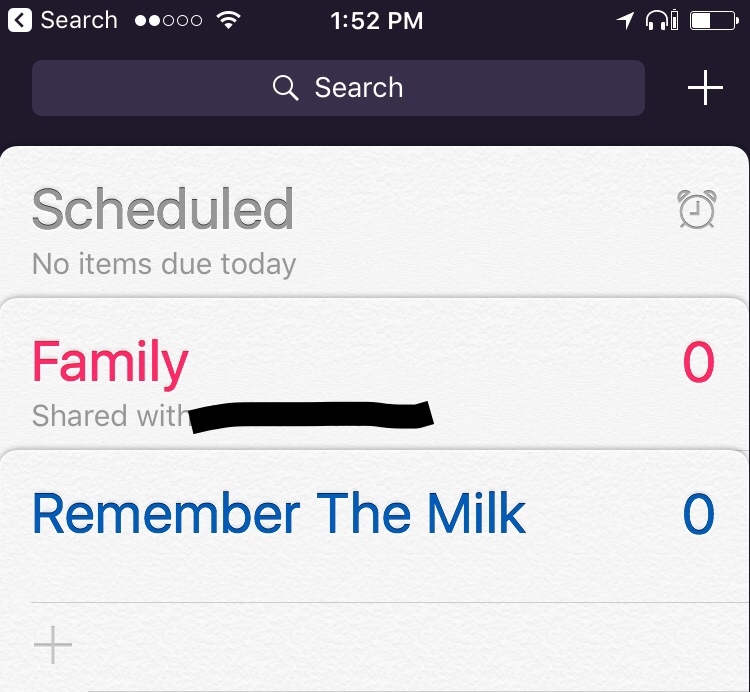 If I just speak to Siri, it goes to RTM (which is set to default), but I can also forego RTM and create a shared reminder with my wife. I've just never tried to add to the shared list with my voice. Anyone have suggestions for a replacement for Android Auto? I've been using android for a while and decided to try an iPhone 7. One of the things I liked a lot was Android Auto. Duolingo has added Japanese for iOS users! Coming to Android and browser soon! They're going to have some bonus lessons specifically aimed at the Olympics! PSA for the new version of Skype. It uploaded my Contacts to Microsoft without the opportunity to opt out. Plus the new interface is garbage. If you use Skype then it seems the older version will continue to work fine so, if you don't have automatic updates enabled like me, well, hold off! For the curious, the current version has an average rating of 1 star on iTunes (the lowest possible rating). In the space of podcatchers/podcast players, I had been using Downcast, but I switched to Castro, and it has made a huge difference. I had been having issues with disk space where I had a huge backlog. Castro solves the problem by using an Inbox concept. So, new shows show up in the "Inbox", where you have two options: Queue, where it gets downloaded, or Archive where it gets... archived. So your backlog just sits in the "Inbox" and doesn't get downloaded. It's really neat. Anyone familiar with any call blocking apps from this page? I do the same sort of thing right in Downcast -- podcasts can either be streamed or downloaded. Most of the time I am in range of fast wifi or a good cell signal, and I just stream everything. So I may have a huge backlog, but it doesn't really take up any space. I'm using nomorobo and it works great. Wuh? I didn't realize they had an app! I use them for my Verizon FIOS home phone and it's amazing. You either get no calls, or your phone rings once and then stops. Edit: ... and thanks also to karmajay I suppose for posting the list. I guess. So after the all the love I gave Remember The Milk (RTM) a while back, I think I am going to switch over to Todoist. The reason? There's two. It has system-level integration with the Amazon Echo (not just a skill like RTM) and now with iOS11 you can tell Siri to add tasks "with Todoist." I've tested both of these and they work perfectly. The Echo integration is great. I used to have to use the skill and say, "ask Remember The Milk to add a task to walk the dog" or use an IFTTT applet to send Echo tasks and shopping lists items over to RTM, then I would later have to manually clear out the two Echo lists afterward. Now with Todoist these two lists sync automatically. Items you add to one app auto-syncs to the other and vice-versa. Better yet, any Todoist tasks that are due "today" will also show up on the Echo to do list so you can ask Alexa, "what's on my to do list today?" The Siri integration on iOS11 surprised me though. I didn't know Apple added more third-party app functionality to Siri. (She still can't play 3rd party music though damn it!) The only downside is you have to remember to say "...with Todoist" or it will go to the regular reminders app. I think I am going to create an IFTTT applet to catch mistakes by forwarding any tasks from Reminders to Todoist. If anyone is looking for a great Reddit app check out Apollo. It gorgeous and works perfectly. Better than the actual Reddit app? EDIT: If the video's representative, heck yeah. I found a really nice app to stream music from YouTube. Really nice so far as it supports background play. $4 to remove ads. Is there a better alarm for the iPhone than the default one found in the clock app? Specifically, I'd like to be able to cancel my next alarm without needing to cancel all future alarms. Currently if I have a day off because of a holiday, or if I just wake up 5-10 mins early, I need to turn my alarms off, wait until after my alarm would've gone off, then turn them back on again. And if I ever forget that last step, I've screwed myself over for the next morning. I just tell Siri to cancel my next alarm. OMG is it that simple? It never would've occurred to me to ask Siri to do something I didn't see an option for in the app. I'll have to give it a try on Thanksgiving. Sure is, I use it all the time. Siri is quite useful nowadays. It's frustrating. I also have set a reminder to take my medicine everyday, and in that app, if I ever take it before the scheduled time, I can mark it complete and won't get the notification popping up that day. And it will continue to remind me in the future. I just want something like that on my alarm for days I wake up early or have a scheduled day off. Ah sorry, I failed reading comprehension. Nothing comes to mind that can do what you want off the bat. I use it mainly for timer based alarms. I've been using a newsletter app for a couple of weeks called Stoop. When you sign up, you get a separate @stoop.email email address that you use to sign up for email newsletters instead of having them go to your personal email account. I don’t know how they're dealing with spam, but so far the app has only shown me the newsletters I’ve signed up for.